It’s spring time again and you can’t wait to break out the power equipment you purchased last year to tame the jungle that’s beginning to overtake your property. More importantly, you get to show off in front of your neighbors. You rode your lawn mower like a King on his horse, proudly waving to your loyal subjects as they kneeled before your lawn. Occasionally you would stop and converse with the common folk, just to satisfy their envious desires. But, nothing could keep you away for too long. Even the string trimmer and leaf blower seemed like toys you could play with for hours. But it’s time to get down to business. You’ve got a huge barbeque to host this weekend. Lifting the garage door and rolling out your riding mower, it begins to shine with pride in the sunlight. What a machine! Nothing could ruin this day. Anxious to hear the engine purr you press the start button, the engine sputters and then conks out. Not a big deal, maybe it was just a fluke. You attempt to start it three more times, but the same thing happens. It doesn’t start! With no time to spare, you are forced to take the walk of shame. With your head hung low, you shuffle your way through the neighbor’s yard and shamefully knock on the front door, making sure no one else sees you. Asking to borrow their lawn mower is like asking for a kidney. You reluctantly use their mower, knowing that they’re inside snickering at you. After the grass is cut, you at least get to have some fun with your string trimmer and leaf blower, right? Wrong, they won’t start either. Just a few sputters of life then total silence. There’s plenty of gas in the tanks, so why is your next-to-new power equipment rebelling? There’s a similar reason why all of your power equipment is failing to start. It’s not the amount of fuel in the tanks, it’s the fuel itself. The gas in your tanks has gone bad, preventing start up. Over the winter, the gas in the tanks slowly became stale. These days, ethanol is the leading cause of this stale gas. Today, many fuel sources contain E10 ethanol additive (10% ethanol and 90% gasoline). Ethanol is a by-product of various agricultural crops, such as corn. Since ethanol is considered a renewable energy resource, it’s blended with gasoline; thus it attempts to reduce our dependence on foreign oil. Similar to alcohol, ethanol is a very powerful solvent. It can dissolve some solid materials like plastic, steel, aluminum, rubber, and fiberglass. Small engines are not built to run on this ethanol-gasoline blend. Ethanol is prone to absorbing water, which everyone should know is bad for your fuel and your engine. 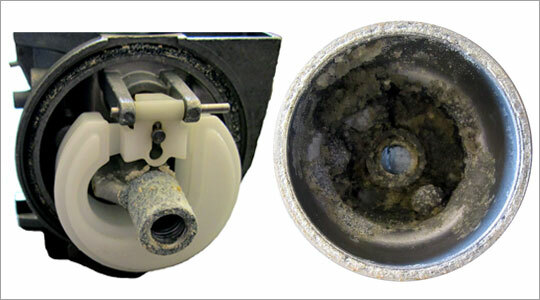 The one-two punch of water absorption and dissolving power can wreak havoc on your small engine parts. Plastic fuel lines or plastic fuel tanks begin disintegrating, leaving a gummy-like substance to muck up your engine parts, especially your carburetor. These damages can turn into expensive repairs, all due to the E10 ethanol additive in the fuel. Keep your ethanol-blended gas from going bad by only buying a 30 day supply of fuel. E10 has a shelf life of 90 to 100 days once it leaves the refinery. By the time you pump it from the gas station, it may only have 30 days of life left. That’s only 1 month! To be safe, assume your fuel has a shelf life of 1 month. The fuel that was in your lawnmower, string trimmer, and leaf blower had probably been sitting for over 3 months, correct? One way you can increase the life of your fuel, especially E10, is to use a fuel stabilizer like Sta-Bil, Startron, or Seafoam the same day you purchase the fuel. A fuel stabilizer acts as a shield around your fuel, preventing it from degradation and oxidation over longer periods of time. A good fuel stabilizer can lengthen your fuel’s shelf life up to 5 times. You do the math! How long does your supply last now? You’ll be reducing engine damage and you’ll stop worrying that your fuel will go bad at the end of each month. A busy reputable gas station sells more gas, so they will have the freshest fuel. If accessible, use gasoline without ethanol. Keep an eye out for “ethanol free gasoline” or search the Internet to locate distributors in your area. Maybe your neighbors know a good place. There’s a beneficial way to store your equipment if it won’t be used for more than a month. Most importantly, remove and dispose of the old fuel in your machine. Here’s a step-by-step guide on proper procedures for storing small engine equipment. Be sure to refer to your equipment’s owner’s manual for any recommendations or procedures. If you want to become King and rule your kingdom again, take these E10 precautions seriously. Don’t use old gas, and add fuel stabilizer to your supply.